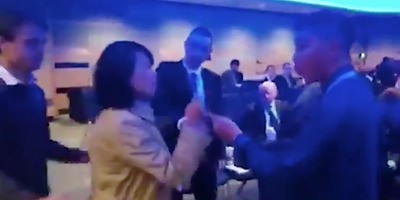 Hong Kong Free Press/TwitterKong Linlin, a Chinese state journalist, slapped a volunteer at a British Conservative Party fringe event on September 30. A Chinese journalist shouted at a panel and slapped a volunteer at a fringe event at the British Conservative party conference on Sunday. She was restrained, and then escorted out. Beijing then demanded an apology from the Conservative party. 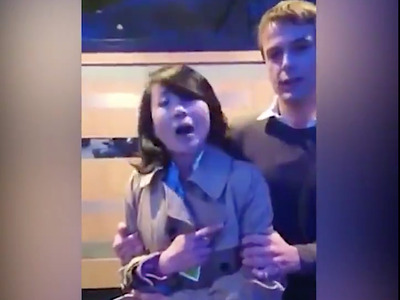 Beijing is demanding that the British Conservative party apologise for kicking out a Chinese journalist who slapped a volunteer at a conference. Kong Linlin, a reporter for the state-run China Global Television Network, was restrained and evicted from a fringe event about politics in Hong Kong at the Conservative party conference on Sunday after she shouted at the panel and slapped a volunteer who asked her to leave. In her defence, the Chinese government argued “she simply raised a question and expressed her opinions” like any other journalist. This video below, published by the Hong Kong Free Press, shows Kong shouting at the event’s attendees and slapping the volunteer, who later identified himself as Enoch Lieu. It’s not clear what part of Lieu’s body was slapped. The South China Morning Post said she hit him twice. Video: UK Conservative Party member 'assaulted by Chinese state TV reporter' during @hk_watch event at conference. Kong, 48, was also briefly arrested on suspicion of common assault, West Midlands Police told Business Insider in a statement. She was released shortly after, the force said. 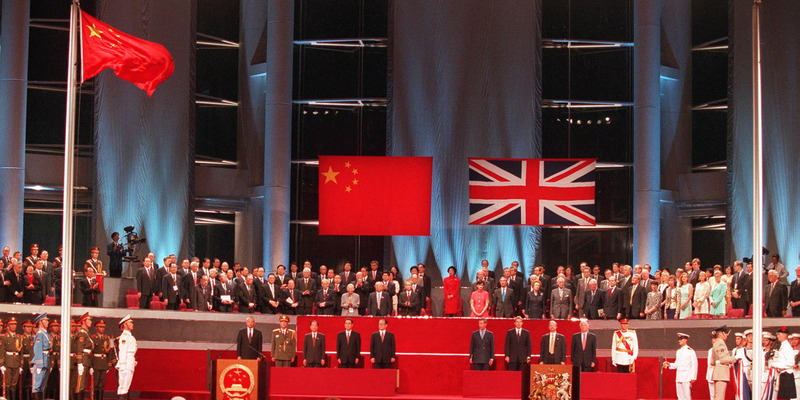 Hong Kong, a former British colony, is a thorny subject for Beijing. The city is a Chinese special administrative region, which means that while it belongs to China, it operates under a separate government and judiciary. Kong on Sunday shouted that the panel was “not being properly Chinese and being puppets,” David White, who attended the event, told Business Insider. Hong Kong Free Press/TwitterKong was restrained and escorted out of the fringe event. Chinese state media, the Chinese Embassy in London, and various Chinese journalists have leapt to Kong’s defence. “In a country that boasts freedom of speech, it is puzzling that the Chinese journalist should encounter obstruction in such a way and even assault at the fringe event when she simply raised a question and expressed her opinions. This is completely unacceptable. Kong’s employer, the state broadcaster China Central Television, also said on Monday that it was “unacceptable that such an infringement took place in a country that boasts about freedom of speech,” and demanded an apology. Kimimasa Mayama (Reuters)Britain handed Hong Kong, its former colony, over to China in July 1997. The city is now a Chinese special administrative region that operates under separate laws. Many Chinese journalists have also rallied behind her. Li Mu, a Chinese columnist, claimed on microblogging site Weibo that Kong had been hit first, and that she should consult a lawyer. There is no indication or evidence that Kong was assaulted first. Kong appeared to agree to Li’s claim, writing in response: “My freedom of movement was restricted at the time, and couldn’t call the police.” She has also liked multiple tweets of support. Business Insider has contacted Fiona Bruce MP, the organiser of the event, for comment.